Laughing Death, more commonly known as Kuru, was exclusive to the tribal Fore people of New Guinea. The disease, which was characterized by sudden bursts of maniacal laughter, hit the headlines in the 1950s and drew in doctors from around the world. The name kuru means “to shiver” or “trembling in fear.” The symptoms of Laughing death include muscle twitching and loss of coordination. Other symptoms include difficulty walking, involuntary movements, behavioral and mood changes, dementia, and difficulty eating. The latter can cause malnutrition. Kuru has no known cure. It’s usually fatal within one year of contraction. U.S. and Australian physicians observed men and women with shaking limbs, which subsided with rest, but a month to three months later sufferers would begin to sway and stumble, lose the ability to stand, become cross-eyed and lose the power of coherent speech before eventually dying. The National Institute of Neurological Disorders and Stroke reported that tests on the deceased showed death had been caused by the emergence of holes in the brain, known as “swiss-cheesing.” It led to the creation of a new class of diseases including Creutzfeldt-Jakob disease, Gerstmann-Sträussler-Scheinker disease, and fatal familial insomnia. Today the study of kuru still impacts research on neurodegenerative diseases. Eventually, the U.S. physician Carleton Gajdusek worked out that the infection was being passed on through the village custom of eating family members after death. When cannibalism was eliminated, the epidemic came to an end. In 1976, Gajdusek was awarded the Nobel Prize for his work. What are the Signs and Symptoms of kuru (laughing Death)? 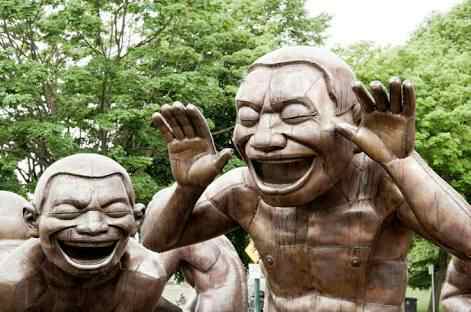 What are the causes of kuru (Laughing Death)? How can I prevent kuru (laughing death)? Kuru belongs to a class of diseases called transmissible spongiform encephalopathies (TSEs), also called prion diseases. It primarily affects the cerebellum — the part of your brain responsible for coordination and balance. Unlike most infections or infectious agents, kuru is not caused by bacteria, virus, or fungus. Infectious, abnormal proteins known as prions cause kuru. Prions are not living organisms and do not reproduce. They are inanimate, misshapen proteins that multiply in the brain and form clumps, hindering normal brain processes. Creutzfeldt-Jakob, Gerstmann-Sträussler-Scheinker disease, and fatal familial insomnia are other degenerative diseases caused by prions. These spongiform diseases, as well as kuru, create sponge-like holes in your brain and are fatal. You can contract the disease by eating an infected brain or coming into contact with open wounds or sores of someone infected with it. Kuru developed primarily in the Fore people of New Guinea when they ate the brains of dead relatives during funeral rites. Women and children were mainly infected because they were the primary participants in these rites. The New Guinea government has discouraged the practice of cannibalism. Cases still appear, given the disease’s long incubation period, but they are rare. blood tests, such as thyroid, folic acid level, and liver and kidney function tests (to rule out other causes for symptoms). Tests such as electroencephalogram (EMG) are used to examine the electrical activity in your brain. Brain scans such as an MRI may be performed, but they may not be helpful in making a definitive diagnosis. There is no known successful treatment for kuru. Prions that cause kuru can’t be easily destroyed. Brains contaminated with prions remain infectious even when preserved in formaldehyde for years. Kuru is exceptionally rare. It’s only contracted by ingesting infected brain tissue or coming into contact with sores infected with kuru prions. Governments and societies sought to prevent the disease in the mid-20th century by discouraging the social practice of cannibalism. According to NINDS, the disease has almost completely vanished. The incubation period of kuru — the time between initial infection and the appearance of symptoms — can be as long as 30 years. Cases have been reported long after the practice of cannibalism has ceased. Today, kuru is rarely diagnosed. Symptoms similar to those of kuru more likely indicate another serious neurological disorder or spongiform disease.